Utilization pricing is very similar to what you may when booking a hotel room. For example, a hotels rates may increase greatly based on the amount of rooms that have been booked. In many cases, this can greatly increase revenue for a busy time of year or special event in your area. How does Wheelbase calculate utilization? We calculate utilization by looking at how many vehicles are available for the dates that the renter is selecting. For example, lets say you have 10 vehicles. If the renter is looking to book from January 1st through January 7th, and you only have 2 vehicles available for this date range, that means 8/10 of your vehicles are booked for the 1st - 7th, thus bringing you to 80% utilization. Using the example above, this means that if you did have a rule set up to increase your pice by 10% once your fleet is at 80% utilization, the renter looking to book for the January 1st - 7th reservation would see an increase of price by 10%/night. Note: Utilization pricing is only calculated for the vehicles selected on this rule. Step 1: Create a rule using the "Utilization & Optimization" as seen highlighted below. Add your adjustment, then set your percentage OR dollar amount increase. 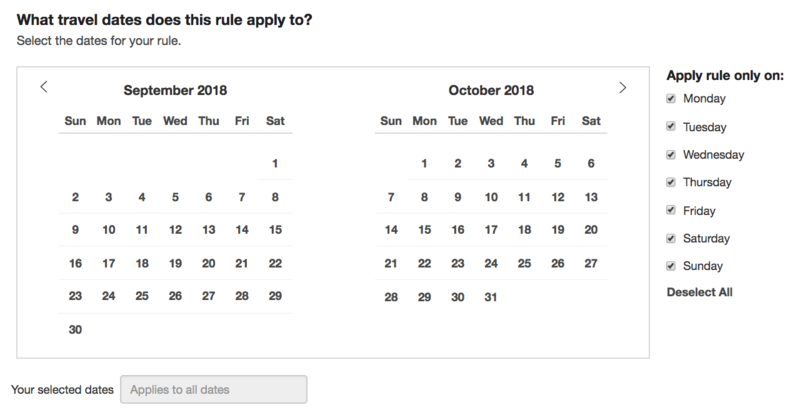 Step 3: Select which date range this rule would apply within. Example: Only apply this utilization price increase during high season. Step 4: Select which vehicles this rule would apply on. Note: As seen below, you can apply a rule to a vehicle type, but also to a specific vehicle if you would like. That's it! You've now created your first utilization rule. As always, don't hesitate to reach out with any questions.